Fifteen faculty members from the University of Cincinnati’s Medical Campus were honored March 5, 2019, for securing 15 U.S. patents during 2018. 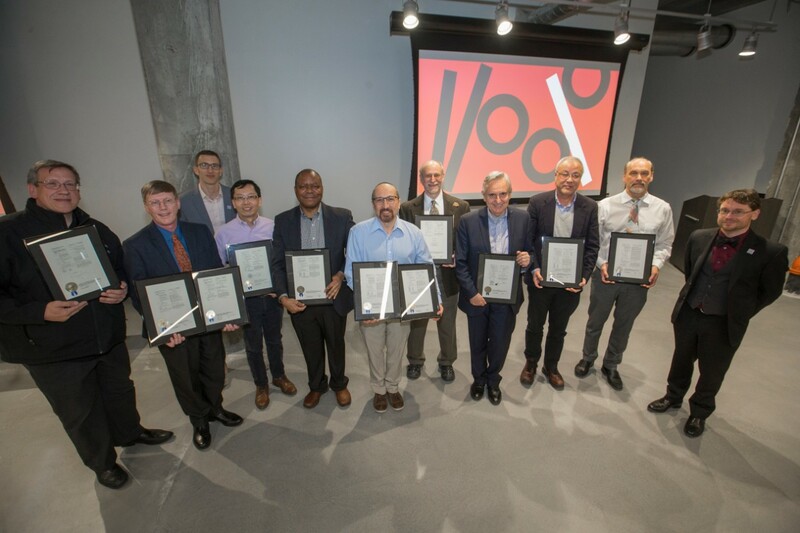 The researchers were among 21 UC faculty celebrated at the university’s inaugural Patent Recognition Awards at the 1819 Innovation Hub. These research accomplishments are aligned with the university's Innovation Agenda and strategic direction, Next Lives Here. Those honored included 14 faculty from the College of Medicine and one from the James L. Winkle College of Pharmacy. Zalfa Abdel-Malek, PhD, professor in the Department of Dermatology, received patent No. 9,834,580 “Pharmaceutical compositions comprising selective peptide-based agonists of melanocortin 1 receptor.” Short tri- and tetrapeptides according to the following Formula I Ar(CH2)mX1—X2—CO—X3—X4—X5-(Trp)n-NX6R are potent, selective agonists of melanocortin 1 receptor (MC1R). Provided herein are pharmaceutical compositions including Formula I peptide agonists of MC1R and methods of treating skin diseases and disorders that include administering to an individual in need thereof a therapeutic amount of a Formula I peptide. The peptides, pharmaceutical compositions, and methods described herein are useful in the treatment of diseases and disorders that benefit from agonism of MCIR, including melanoma, basal cell carcinoma, squamous cell carcinoma, porphyria, polymorphous light eruption, vitiligo, and solar urticaria. Laura Conforti, PhD, associate professor in the Department of Internal Medicine’s Division of Nephrology and Hypertension, received patent No. 9,777,279 “Methods and compositions for treating autoimmune disorders by targeting Kv1.3 ion channels with functionalized lipid-derived nanovesicles.” Synthesis and pharmaceutical compositions of antibody-functionalized nanovesicles encapsulating ion channel knockout siRNA, and methods of treating autoimmune diseases associated with increased expression and/or hyperactivity of T cells by selectively targeting memory T cells with the nanoparticles, which deliver their siRNA cargo into the cytosol of the TM cell thus reducing ion channel expression and decreasing Ca2+ influx. Zhongyun Dong, MD, PhD, professor in the Department of Internal Medicine’s Division of Hematology and Oncology, received patent No. 9,895,363 “Methods for modulating function of proliferating cell nuclear antigen (PCNA) and treating cancer with PCNA-targeting compounds.” Pharmaceutical compositions and methods for inhibiting cell growth, modulating function of PCNA, treating prostate cancer, and enhancing PCNA trimer formation are disclosed. Fred Finkelman, MD, professor emeritus, Marat Khodoun, PhD, assistant professor, and Suzanne Morris, PhD, associate professor, all in the Department of Internal Medicine’s Division of Immunology, Allergy and Rheumatology, received patent No. 9,795,618 “Methods and compositions for suppressing IgE-mediated anaphylaxis.” Methods for suppressing IgE-mediated anaphylaxis are provided herein, which include administering to a person in need thereof a combination of at least two therapeutic agents selected from the group consisting of an antihistamine, one or more beta-adrenergic agonists, and one or more tyrosine kinase antagonists. Also provided herein are methods of suppressing IgE-mediated anaphylaxis associated with immunotherapeutic desensitization of a subject, and pharmaceutical compositions for suppressing IgE-mediated anaphylaxis. Finkelman and Khodoun also received patent No. 9,868,786 “Methods for suppressing allergic reactions.” Provided are methods for suppressing IgE and IgG-mediated allergic reactions through monoclonal antibody applications. More specifically, methods are herein provided for safe induction of rapid desensitization. Specific embodiments are herein provided for suppressing allergic reactions in a subject, including specific methods of providing a monoclonal antibody selected from the group consisting of anti-FcεRIa and anti-FcγRIIb/RIII; administering the antibody to a subject at a dose that is lower than the level required to induce shock; and administering sequentially escalating doses of the monoclonal antibody so as to induce rapid desensitization to an allergen, thereby suppressing allergic reaction in the subject. Daniel Hassett, PhD, professor in the Department of Molecular Genetics, Biochemistry and Microbiology, received patent No. 9,925,206 “Compositions and methods for treating bacterial infection.” Compositions and methods of utilizing the same are provided for treating bacterial infections. The compositions comprise acidified nitrite in combination with an iron chelator and an antibiotic. The compositions of the present invention are effective at treating bacterial infections with minimal to no side effects. Surprisingly, the combination of these three agents has a synergistic effect, which advantageously permits a lower dose of one or more of the active agents (e.g., the antibiotic). Daniel Kanter, MD, professor, from the Department of Neurology and Rehabilitation Medicine, and Jonathan Bernstein, MD, professor from the Department of Internal Medicine’s Division of Immunology, Allergy and Rheumatology, who, along with collaborator Anastasios Angelopoulos, PhD, associate professor in UC’s College of Engineering and Applied Sciences, received patent No. 9,921,167 “Optical sensor based on PFSI membrane comprising associated benzene-1,3-diol for detecting target compounds, and method thereof.” An optical sensor for monitoring an environmental condition, the optical sensor comprising a perfluorosulfonate ionomer membrane comprising a solution, wherein the solution comprises a transition metal-free dye component, wherein exposure of the optical sensor to a specific environmental condition produces a color shift on the optical sensor. Andrew Norman, PhD, professor in the Department of Pharmacology and Systems Physiology, received patent No. 9,758,593 “Compositions and methods for treating cocaine-related disorders.” Methods for treating a cocaine-related disorder in an individual include administering to the individual a therapeutic amount of an antibody comprising a human immunoglobulin gamma heavy chain and a murine lambda light chain. In another embodiment, the light chain includes a human kappa light chain at least partially derived from 1B3. Other embodiments are directed toward the antibodies themselves and methods of binding the antibodies. Norman also received patent No. 9,957,332 “Compositions and methods for treating cocaine-related disorders.” A method of treating a cocaine-related disorder in an individual is provided, the method including administering to the individual a therapeutic amount of an antibody comprising a human immunoglobulin gamma heavy chain and a murine lambda light chain. In a specific embodiment, the antibody is a monoclonal antibody comprising a murine lambda light chain variable region, a human gamma heavy chain variable region, and a human kappa or lambda light chain constant region. Xiaoyang Qi, PhD, professor in the Department of Internal Medicine’s Division of Hematology and Oncology, received patent No. 9,757,432 “Materials and methods useful for treating glioblastorna.” The present invention provides compositions and methods useful for treating cancers such as glioblastoma. SapC-DOPS was found to be synergistically effective at inducing cell death when administered in conjunction with rapamycin. SapC-DOPS/rapamycin combination therapy allows physicians to give lower doses of each drug and achieve better therapeutic efficacy. The compositions also allow for less toxicity and fewer off-target effects. Related methods and materials are also provided herein. William Ridgway, MD, professor in the Department of Internal Medicine’s Division of Immunology, Allergy and Rheumatology, received patent No. 9,938,348 “Stimulation via TLR4/MD-2 to reverse type 1 diabetes.” Disclosed are methods and compositions for treating Type I diabetes in a subject. Agents selected from a TLR4 agonist, a TLR4/MD-2 agonist, or a combination thereof may be used in the disclosed methods and compositions. Also disclosed are methods of restoring adaptive immune T cell tolerance, treating pernicious insulitis, improving immune tolerance, and treating autoimmune diseases using the disclosed methods and compositions. Patrick Tso, PhD, professor in the Department of Pathology and Laboratory Medicine, received patient No. 9,730,980 “Method of treating type I diabetes using apolipoprotein A-IV.” Methods for treating type one diabetes mellitus in a subject in need thereof and pharmaceutical compositions for the treatment of type one diabetes mellitus are disclosed, including combination therapies with insulin. The methods include administering an effective amount of apolipoprotein A-IV to the subject having type I diabetes. The pharmaceutical composition includes apolipoprotein A-IV formulated for administration to a subject for the treatment of type one diabetes mellitus. Tso also received patent No. 9,951,120 “Method of treating diabetes using non-glycosylated apolipoprotein A-IV.” Methods for treating type two diabetes mellitus in a subject in need thereof and pharmaceutical compositions for the treatment of type two diabetes mellitus are disclosed, wherein the methods and compositions of the invention are based on the use of non-glycosylated apolipoprotein A-IV produced by a protein expression system, such as a bacterial expression system. Also disclosed are methods for substantially restoring glucose tolerance in a subject in need thereof to a normal level and methods for lowering blood glucose levels in a subject in need thereof based on administering non-glycosylated apolipoprotein A-IV produced by a protein expression system. Yi-Gang Wang, MD, PhD, professor in the Department of Pathology and Laboratory Medicine, received patent No. 9,868,938 “Methods for accelerated and enhanced cardiac differentiation of IPS cells by electrical stimulation.” Methods of generating cardiomyocytes from induced pluripotent stem cells (IPSCs) are provided. More specifically, the present disclosure relates to methods of generating cardiomyocytes from iPSCs using electrical stimulation. In some aspects, uses of such cells for therapeutics and in methods of treatment are provided. Georg Weber, MD, PhD, associate professor at the James. L. Winkle College of Pharmacy, received patent No. 9,873,915 “Grading, staging and prognosing cancer using osteopontin-C.” The present disclosure provides methods and kits that can be used to determine the grade or stage of a breast or other cancer, such as a ductal carcinoma in situ (DCIS). By determining the grade, stage, or aggressiveness of a cancer, appropriate therapeutic regiments can be selected and administered to the patient with the cancer. The method includes detecting osteopontin-c (OPN-c), wherein the presence of high amounts of OPN-c in the cancer sample indicates that the subject has a more aggressive form of cancer (e.g., grade 3). Feature photo by Joe Fuqua.